← Hey parents: would you go on strike? Never heard of Bols Genever? 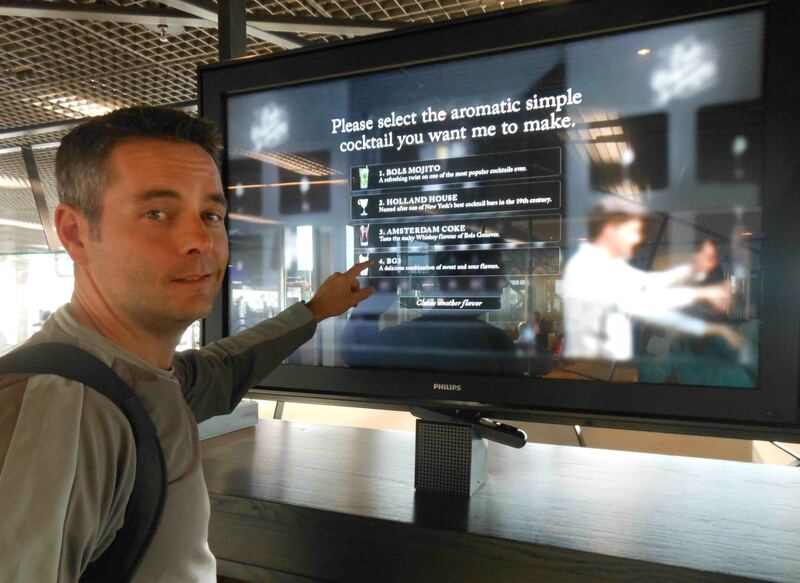 Neither had I until a four-hour stopover at Schiphol airport in Amsterdam. 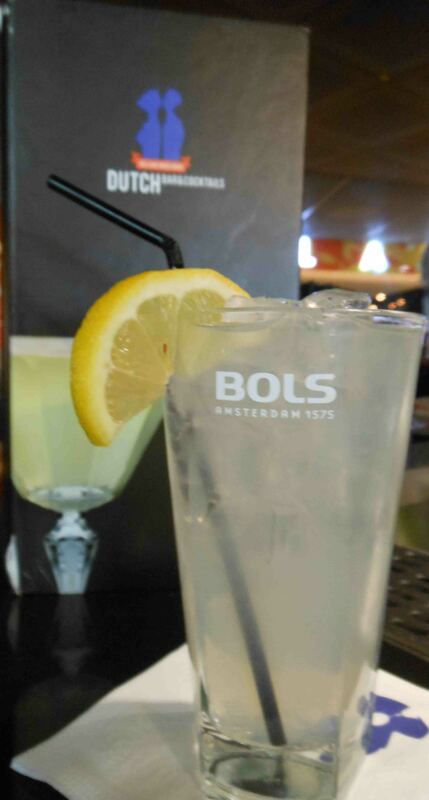 Bols is an Amsterdam-based liqueur maker that also makes its own version of gin, called genever. 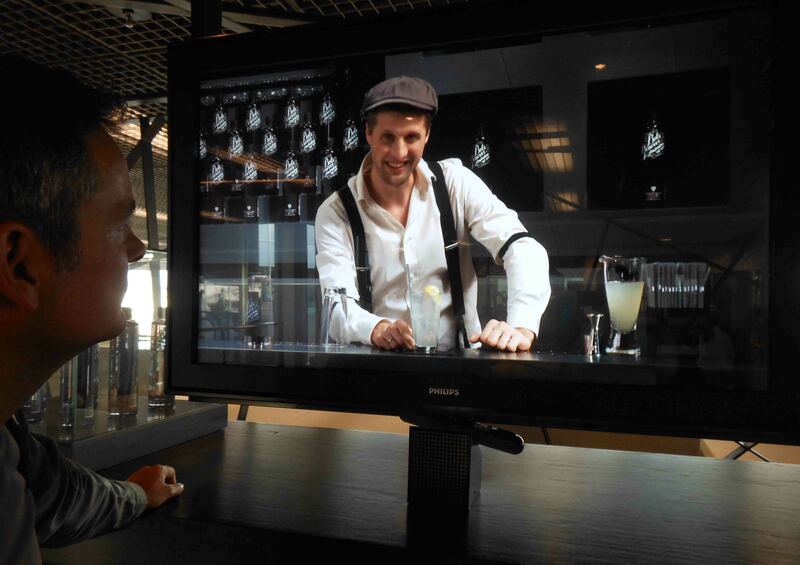 I gathered that Bols was kind of a big deal in town since the airport featured not only a bar lined with Bols products, but a cocktail kiosk dedicated to educating tourists. Blake chooses a cocktail based on his taste preferences. Then, Antony shakes it up. Blake and I stopped into the kiosk where virtual bartender Antony invited us to choose a cocktail based on our taste preferences. After picking a Holland House, he walked me through how to make one. I got thirsty despite the fact it was 9 a.m. (which explained the shocking number of people already in the bar). Then, I printed off the recipe and Antony instructed me to take it to the bar to get a 15 percent discount on the drink. Well, okay. With his jaunty cap and suspenders, Antony embodies pre-prohibition happy hour. Who’s thirsty? We sat right at the bar and showed our drink recipes to the real bartender. Unlike Antony, he hadn’t a clue how to make a BG3 or Holland House, and spent the next 15 minutes eyeing up the recipes and trying to find the dry vermouth. That was fine though because by the time we were served it was close to 11 a.m. and I felt it was okay to start drinking since it was almost noon in Tanzania. Blake got the BG3 and liked it even though he’s not a gin fan. I loved my Holland House: tart, smooth and really the perfect drink to knock back at 3 a.m. Calgary time. Cheers! Shake all ingredients with ice and fine-strain into a coupette. Garnish with a lemon zest. Look at the bottles behind the bar and you’ll see Bols. Build in a tall glass with ice. Top up with bitter lemon and garnish with a lemon wedge. Not unlike a Tom Collins: tall and refreshing. 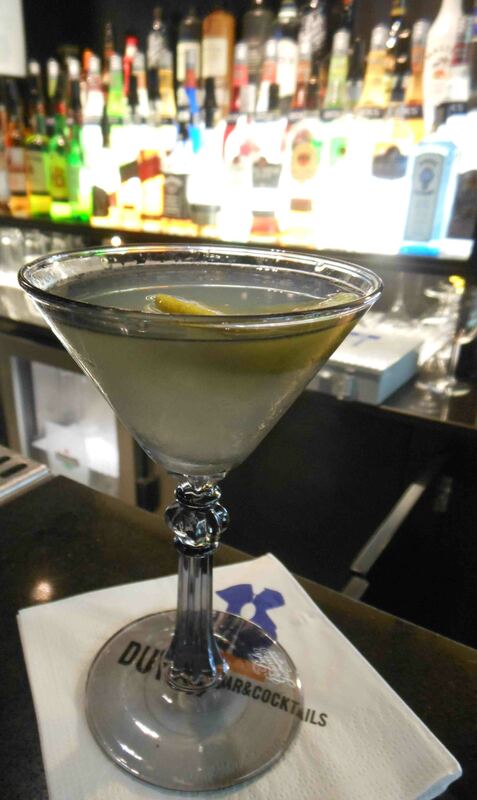 This entry was posted in Cocktails, Travel and tagged BG3 cocktail, Bols cocktails, Bols Genever, Drink of the Week, drinks at Schiphol airport, Holland House cocktail. Bookmark the permalink. When we arrived in Barcelona it was 8 am Sunday morning. The flat we had rented wasn’t quite ready so we stumbled down La Rambla in our jet lagged haze looking for coffee. We found many young people drinking beers at the outdoor cafes in their club wear, apparently they just weren’t ready to go to bed yet even thought ut was 8 am, 30 degrees, and sunny! Ahhh, Europe, Let us envy your partying ways. I hope you guys are having fun! The sangria in Barcelona is muy bien. Have you see a hipopotamo yet?